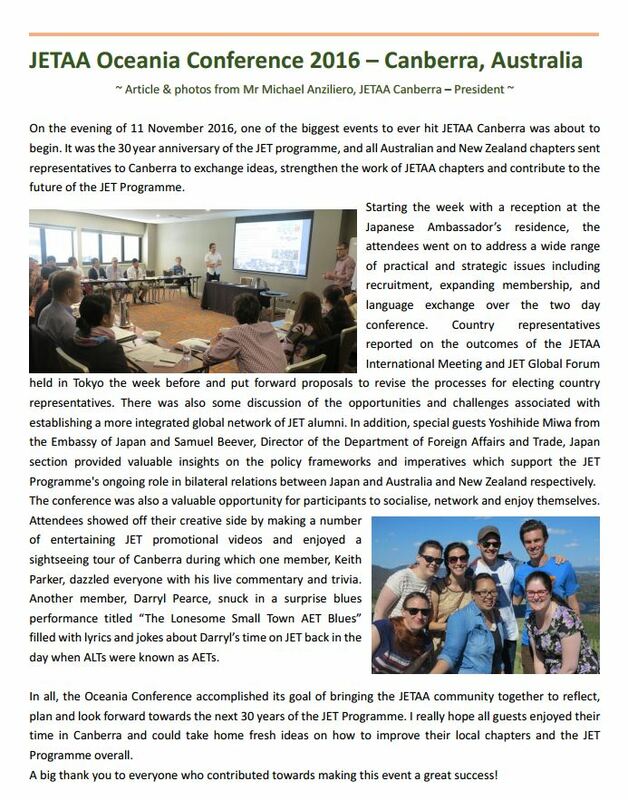 On Friday 11th of November, a reception was held at the Japanese Ambassador’s residence for representatives of JETAA chapters from Australia and New Zealand to welcome them to Canberra for the annual JETAA Oceania Conference. At the reception, guests included the presidents of each JETAA chapter, officials from the Council of Local Authorities for International Relations (CLAIR) and the Department for Foreign Affairs and Trade. Minister Takashi Katae, Deputy Chief of Mission mentioned in his speech that Australia and New Zealand have both participated in the JET Programme from its beginning in 1987, and that each JET participant plays a great role in the relationship between our countries. Minister Katae expressed his wishes for greater success in the future for JETAA. The JET Programme is celebtrating its 30th anniversary this year, and the Embassy promises to further strengthen its effort to contribute to the advancement of this Programme.